It was a day long celebration of global cultures and holiday traditions. Activities include storytelling, cultural activities, games, freedom dialogues and more, from countries/regions such as Puerto Rico, India, Japan, and many others. Read more... | 2025 bytes more | Comments? As every 1st Saturday of the month, Salsa Caliente delivered again some very HOT SALSA this Saturday, Dec. 2nd, at Havana Martini Club. On Saturday, Dec. 2nd, SHPE OHIO-SW Chapter had its annual Holiday Party. We also wished Farewell to Jose and Odette Gutierrez, who are moving to California. Jose was the first President of SHPE and he and his whole family will be dearly missed. We also had little sharing of Christmas gifts among the participating members. Little Gifts for Holidays at Su Casa! YWCA organized at Su Casa this Saturday a "Little Gifts for Holidays" for immigrant women. YWCA provided wood boxes and all the required painting materials, and the participants used their creativity to come up with cool colorful designs for the boxes. They will be used as Holiday gifts for their families. Dec. 1st is the World AIDS Day. Light to Unite is an initiative the drug group Bristol-Myers Squibb coordinates with the National AIDS Fund to increase awareness about HIV/AIDS in the U.S. For every candle lit, Bristol-Myers Squibb will donate $1 up to $100,000 to the National AIDS fund. According to a 2004 CDC study, nearly 1 out of every 5 people diagnosed with HIV in the U.S. is Hispanic. Read more... | 1111 bytes more | Comments? Not many people know that Mandy, one of our Salseras Extraordinaire, is also a member of the Midwest Bikini Team, an organization of the finest girls from Tri-State area, who are available for hire to do promotional work. They were last in Havana Martini Club last Wednesday to sign their new 2007 Calendars. Santa Maria Community Services presents their 2006 Birthday Brunch on Sunday, December 3rd. Col. Thomas H. Streicher, Jr., Cincinnati Police Chief, will speak at Santa Maria’s 109th birthday celebration, held at the Montgomery Inn Banquet Center, 601 East Pete Rose Way. The event begins at 10:30 a.m. Santa Maria volunteers, Guy and Del Langenbrunner, will be honored for their over 25 years of volunteer service to the agency. Read more... | 2370 bytes more | Comments? HOTTEST Wednesday nights in town - the "Havana Nights" hosted this Wednesday the "Thanksgiving Eve Party"! This was definitely the hottest party in town, and even Cincinnati's Mayor, Mark Mallory stopped by! We felt very honored to have him at our Havana Nights! Congratulations to Tropicoso which won on Sunday CityBeat's CEA Award. There was a big celebration in Mad Frog this Monday during Tropicoso's weekly live performance. Pictures from this week's Salsa with Tropicoso @ Cincinnati's hottest Latino spot - "The Mad Frog", are on the Web in the Cincinnati section of our Photo Gallery (click here). Each Monday, Mad Frog has its basement open - with the best in Reggaeton and Hip-hop. It's like having two clubs in one: live Salsa/Merenge upstairs with Tropicoso, and Reggaeton and Hip-hop downstairs! Chiquita and MidwestLatino presented the sixth annual Latin American Culture Fest at the Cincinnati Museum Center, with media sponsors Latinos Magazine and Radio La Ley 1320. Latin American Culture Fest kicked off the 2006-2007 Passport to the World series that allows visitors to see, hear, touch and explore other cultures without leaving Cincinnati. Each Passport celebration highlights one cultural heritage with a variety of displays, activities and performances. The events provide a forum where visitors can interact with and learn about community members of different cultures. The Rotunda came alive with Hispanic music, dance, arts, crafts, and more representing the cultures of Mexico, Argentina, Peru, Colombia, Brazil, Cuba and Panama. Latin American vendors were selling jewelry, clothing, and many other items related to Hispanic culture. Musical and dance performances run the gamut from the traditional to the contemporary. And children and adults could learn about the many Latin American cultures first-hand through educational and interactive activities. Read more... | 3625 bytes more | Comments? The legendary Johnny Pacheco Y Su Tumbao Anejo, and the opening for him Grupo Fuego delivered a fantastic performances on Saturday in Cleveland as part of the Tri-C JazzFest Picante. Organized by the Cuyahoga Community College and sponsored, among many others, by National City, it was a weekend of never ending, sizzling hot Latin music. The Cincinnati Symphony Education Department is looking for students in grades 7-12 who are interested in music and would like to learn more about careers in music. Parents and students are invited to participate in this free workshop and attend the CSO concert on Saturday, December 2 at 6 p.m.
We strongly encourage any Latino students you may know to attend. The Community Building Institute at Xavier University presents Great Ideas Luncheons, a series of intimate conversations with regional and national experts on community issues. 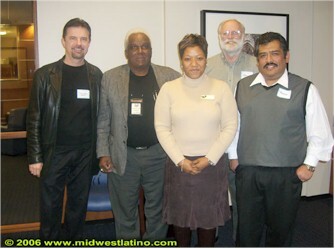 On November 17, 2006 the speakers will be Ramon Leon and John Flory, Latino Economic Development Corporation (LEDC). LEDC developed the Mercado Central Cooperative, an economic development complex created in Minneapolis, Minnesota. We had the honor to meet today John and Ramon, and it is a fascinating example of community organizing that has led to the personal and economic growth of Latino residents in the city of Minneapolis, and we highly recommend to attend the session, even if this is on a short time notice. The cost per luncheon is $20 or register for both sessions for $35. The luncheons begin at noon at the Schiff Family Conference Center located in the University’s Cintas Center. To register or more information, please contact Trina Jackson at 513-745-3348 or jacksont@xavier.edu. Make checks payable to Xavier University and mail to: Trina Jackson, Community Building Institute, 3800 Victory Parkway, Cincinnati, Ohio 45207-5621. This event is sponsored by the Community Building Institute, a partnership between Xavier University and the United Way of Greater Cincinnati. Read more... | 1018 bytes more | Comments?